A couple of days after the region experienced its hottest weather of the year rock superstars Kiss raised the temperature at Birmingham's Barclaycard Arena a few more degrees with a sizzling show that included balls of fire, pyrotechnics and a red hot performance of some of the band's favourite tracks. The capacity crowd was warmed up for the experience by support act The Dives, a New York power pop quartet that boasts Kiss' Paul Stanley's son, Evan, as frontman. Their set, influenced by the glam rock of Kiss and the '70's NY punk scene, was well received by the audience which, 30 minutes after The Dives had exited the stage, could hardly contain its excitement when Led Zeppelin's Rock and Roll blasted from the speakers, signalling the imminent arrival of Kiss. Never ones for understatement, Paul Stanley, Gene Simmons, Tommy Thayer and Eric Singer descended to the stage on platforms and burst into Deuce amid a flurry of fireworks. After a raucous Shout It Out Loud Paul Stanley respectfully led the whole arena in a moment's silence in memory of the victims of the Manchester bombing. It was a fitting tribute and much appreciated by the fans. Kiss themselves were directly affected by the tragedy as their Manchester Arena concert, scheduled for May 30, has understandably been cancelled. Back to the show, and pyrotechnics were again put to good use during Lick It Up as Paul Stanley, Tommy Thayer and drummer Eric Singer ascended high above the stage on rising platforms. 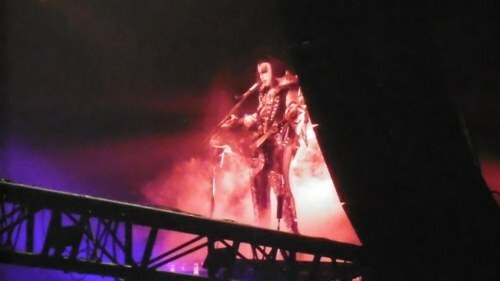 During the show Singer, at the rear of the stage, often found himself surrounded by columns of flame and balls of fire. Obviously the hottest seat in the house! 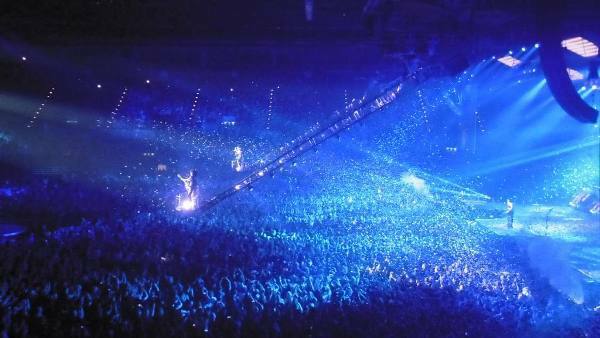 Axeman Tommy had his own fireworks, with sparks shooting from his guitars during his solo song, Shock Me. Nobody outdoes bassist Gene Simmons, however. The Demon didn't disappoint with his trademark fire spitting, blood vomiting and ascent to the lighting rig during God of Thunder (pictured below). How could sprightly 65-year-old Paul Stanley follow that? Easy! 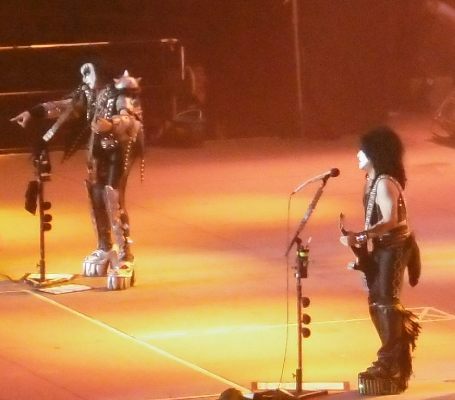 He jumped on a zip wire for a quick trip above the audience to a small revolving stage in the middle of the arena to perform Psycho Circus and Black Diamond. It couldn't be topped. Or could it? 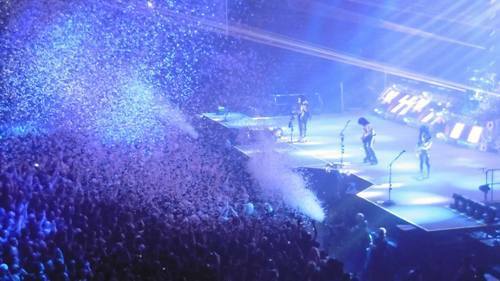 In a final theatrical twist, as tonnes of confetti and streamers rained down on fans, Gene Simmons and Tommy Thayer were taken high over the audience in crane lifts (pictured below). It really did feel that they would Rock and Roll All Nite but the show concluded with an encore of I Was Made For Lovin' You and Detroit Rock City. As the crowd left, God Gave Rock and Roll To You blasted out over the PA and fans with any voice left sang along heartily. A truly memorable night! Kiss play London's O2 on May 31, 2017.